It is a practical book with emphasis on real problems the programmers encounter daily. My overall impressions of this book are excellent. 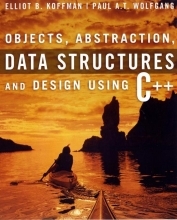 This book emphasizes the three areas I want: advanced C++, data structures and the STL and is much stronger in these areas than other competing books. * Problem-solving methodology used throughout... Think, then code! -Chapter 1. Introduction to Software Design. -Chapter 2. Program Correctness and Efficiency. -Chapter 3. Inheritance and Class Hierarchies. -Chapter 6. Queues and Deques. -Chapter 9. Sets and Maps. -Chapter 11. Self-Balancing Search Trees. -Appendix A: Advanced C++ Topics. -Appendix B: Overview of UML. -Appendix C: The CppUnit Test Framework. 1. Introduction to Software Design. 2. Program Correctness and Efficiency. 3. Inheritance and Class Hierarchies.